The Main Road of Hamadayama in September 2011. Please check how it looked like three years ago >> First essay on Hamadayama. Not much has changed except for the construction site on the left side. Three years have passed since I started this web site and the 200th and at the same time the last essay of the site is a good occasion for me to come back to the home ground, namely Hamadayama. Hamadayama has not experienced a dramatic change in the last three years, though many tiny changes have taken place. It is true that a huge development project is going on in the southern side of Hamadayama Station and more than 500 luxury apartments are being built and sold step by step by Mitsui on its former sports ground of 8,3ha. However, we do not feel so far much from this project. I believe that the situation would not change drastically, as the project itself needs that Hamadayama remains as a comfortable and peaceful place. The main shopping area of Hamadayama exists in the north of the railway station. The road leading from the entrance of Hamadayama Station to Inokashira-dori (street) and the road parallel to the railway are the two major shopping roads, though they are not much crowded. Another parallel road to the railway which exists in the south of the station is occupied by restaurants and izakaya. The most important change around those streets was the closure of the DIY section of Seiyu two years ago. Since then nothing happened to the land and it was said that the land owner was too greedy to agree to a reasonable rent for a well location land. 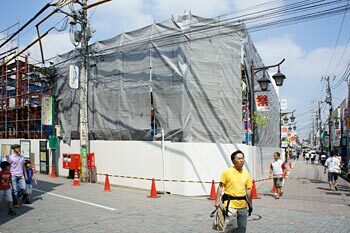 Only recently construction work started (See the photos left) and an iron framework emerged a few days ago. 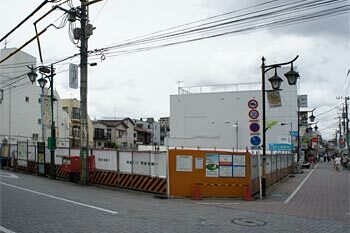 Once the building is completed, the appearance of the station’s front yard will change a lot. I hope that the change will take place in a positive way. The most important thing is that it would not affect the business structure of Hamadayama: most shops are privately owned and large scale chain stores exist only in the limited way. The newly opened KALDI is a chain store specialized in imported foods. There is an interesting statistic concerning the business in Hamadayama. It is surprising that DENTIST(18) is the most popular business in Hamadayama. Dentist is followed by IZAKAYA (15) and BEAUTY PARLOR (13). KEY SERVICE SHOP (11) usually offers services to repair shoes in addition to making spare keys. It is a special feature of Hamadayama that it has more IMPORTED CAR DEALERS (9) such as Porsche, BMW and Ferrari, than JAPANESE CAR DEALERS (8). The large number of BEAUTY PARLORS (13) and LAUNDRIES (9) is also surprising. There might be many single families, I guess. Nevertheless, I wonder why so many beauty parlors can coexist in a small town such as Hamadayama. In contrast to such popular businesses, there are not many restaurants in Hamadayama, though there are many Izakaya. There is only one Chinese restaurant and three Italian and four Korean restaurants in the neighborhood of Hamadayama Station so far as I know. I can also point out that there are very few chain restaurants. As I mentioned earlier, the majority of the businesses in Hamadayama are privately owned small shops, which I appreciate a lot, though big capitals are gradually penetrating into Hamadayama. Anyhow, it is true that the shopping streets near Hamadayama Station are comfortable for pedestrians, because few cars are on the streets. I guess the reasons are that the streets are not suitable for passing through and that the surface of the streets is paved with color tiles which give the impression that they are reserved for pedestrians. In fact, those streets are kept for pedestrians between 16:00 and 18:00 in the afternoon when housewives are on the streets for daily shopping. The public bath Hamanoyu is still crowded with people and numerous tiny izakaya are all well visited. I am sure that Hamadayama will remain a cozy and comfortable place even after the completion of the new building in front of Hamadayama Station. I will write another report from Hamadayama when I come back from a few years' stay abroad. 31 ice cream (joint venture between Fujiya and Baskin Robbins) shop opened recently in place of a take-out sushi shop. On its right is my favorite rahmen restaurant.